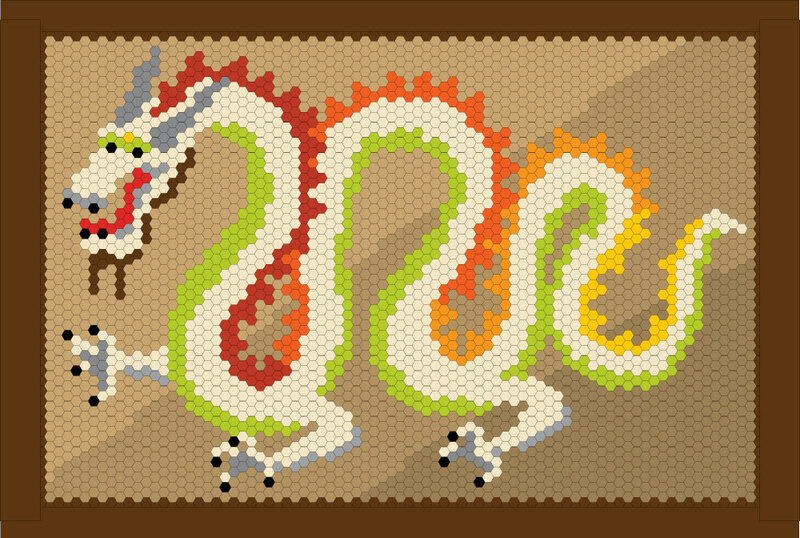 I’ve had the idea for a dragon hexie quilt even before I finished my squid quilt. After a long summer, I finally have the design finished! What do you think? It’s just a rough idea of what actual patterned fabric will look like, and I may change color families as I go ~ but it’s a good start. This quilt will need at least 4,000 1/2″ hexagon pieces which is a much bigger project than the squid at 1,432 hexies. Am I crazy???? Maybe… but I really miss having something to work on wherever I go ~ and honestly, finishing a hand-pieced quilt is pretty satisfying! I ordered some of the pre-cut paper pieces today ~ that means I will start sewing in about a week. The dragon image was chosen because 2012 is the year of the dragon ~ my hope is to be able to finish by the end of 2012…. we’ll see how that goes ~ wish me luck and quick callouses! Oh dang! I really thought it would be that cute caterpillar you took a picture of a while back (with the monofiliment fishing line, of course). Your squid turned out so fantastic, you would be crazy NOT to make your dragon. I do think your hexie projects are a bit insane, but in the best possible way.